Grill chicken breasts over medium high heat until a meat thermometer inserted into the thickest piece reads 170F (77F) – about 5-7 minutes per side. Remove from heat and set aside. Brush romaine hearts with canola oil. Using a hot grill, grill hearts, turning once, just until grill marks appear (approx. 1 minute each side). Take care not to overcook, lettuce should still be crisp. Remove from heat to 4 plates. Cut chicken into 1/2 inch slices. 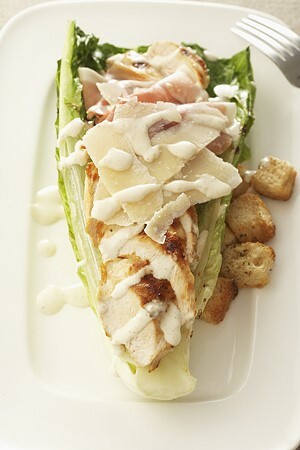 Arrange prosciutto slices, chicken, parmesan, croutons, and capers on top of lettuce. To make dressing, whisk together all ingredients in a bowl. Drizzle over salad and top with fresh cracked pepper. Tip: For an even quicker version of this recipe, use 2 cups of chopped meat from a store-bought rotisserie chicken instead of the chicken breasts. Use your favourite bottled Caesar salad dressing.